My wife, Melanie, has now changed her mind about sleeping in tents. For the first time in a long time she accompanied me on a ‘reserve visit’ all be it rather reluctantly due to the promised tented accommodation. It was the “wow” after “wow” that gave it away as we looked around our canvas sleeping quarters. The large bedroom, with pristinely made bed, contained furniture and fittings normally associated with a high class hotel. ‘Behind’ the bedroom was the en-suite bathroom complete with double bath. A back door leads to the outdoor shower for alfresco washing below the acacia canopy. Clearly a lot of thought and planning has gone into the design and construction of the Springbok Lodge’s upmarket tented camp. The main lodge is equally as stunning. The furniture, surrounded by African decor and art, provides luxurious comfort. Amongst the Zulu shields and beaded cushions there is also a reminder of two of the Lodge’s owners: Springbok legends John Smit and Percy Montgomery have some of their rugby World Cup winning memorabilia hanging from the restaurant walls. Our day at Nambiti Private Game Reserve began with a relaxed lunch on the deck of the main lodge looking across the valley. From our table we could see giraffe, eland and impala. It was only a spectacular early afternoon storm sweeping through the valley that forced us from the deck and provided some relief from the heat of the day. Prior to the late afternoon game drive our drinks order was taken for the three hour excursion. Nothing is left to chance here! Ruaan, our game ranger and driver, collected us from our tent where we joined fellow guests to explore the reserves southern section. 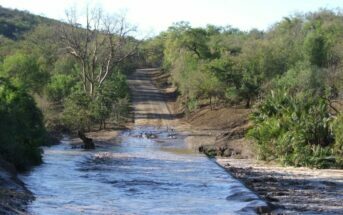 The reserve being extremely wet, through unusually heavy summer rain, meant two things: the dirt roads were extremely difficult to negotiate and the wildlife was dispersed amongst the reserves 11,000 hectres. Despite this we just about negotiated our chosen route and had some close encounters with some of the reserves wildlife. A lioness barely raised an eyebrow as we passed her. A huge, one horned, Kudu only paused momentarily from browsing as we stopped alongside him. Our drinks order was served from a white cloth-draped table overlooking rolling green hills in fading light. Ruaan entertained us with stories of close encounters with elephants and offered us biltong and droe wors to snack on as we listened and laughed. Back at the lodge we were met by staff with hot face towels before a dinner aperitif. Dinner itself, spanning four courses, was taken in the restaurant. Perfectly cooked lamb and dorado with fresh vegetables were accompanied by a choice of fine wines. The day though does not end until your ranger has personally walked you back to your tent. And even then there was one more surprise. Dimmed lights, bed sheets turned back and a full, steaming hot, bubble bath laced tub awaited us. In all my years of sleeping in the Southern African bush I had never realised how loud a Natal Francolin could be. To be honest I did not know what the noise was that greeted us at first light. Two of the partridge like birds, one perched in front and one behind our tent, took it in turns to call. It was an alarm call that could not be slept through! However the timing was perfect for our 6.30am game drive. The hospitality and service at Springbok Lodge seems to never end. Before our early morning drive, tea, coffee and rusks are served. During the drive there are more drinks, muffins and rusks to be enjoyed from one of the reserves many viewpoints. Buffalo at NambitiI always reflect on ‘firsts’ when on game drives and trips such as this one. We had just stopped (at my request) to look at a pair of blacksmith plovers standing close to the edge of the road when three buffalo started to move towards us. Buffalo are a notoriously dangerous part of the Big 5. Ruaan had warned us that one particular buffalo had taken a dislike to vehicles. The male leading these three was that one. Never before had I seen, let alone been in a vehicle, that was charged by an irate buffalo. (Elephant and rhino yes, but never a buffalo). Returning from our drive there was time to take a shower outdoors, look into the bush and reflect on our stay, before breakfast. It was a fitting end to be back on the main lodge deck eating a hearty breakfast looking across the valley. The Springbok Lodge, in the Nambiti Private Game Reserve, is unique. 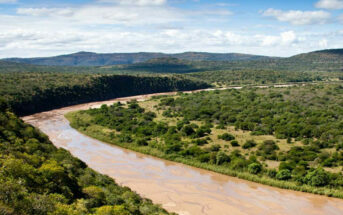 The fact that it is a malaria free big 5 reserve situated in the heart of Kwa-Zulu Natal is unique in itself. Then there’s the luxurious lodge, the fine food and the dedicated staff. 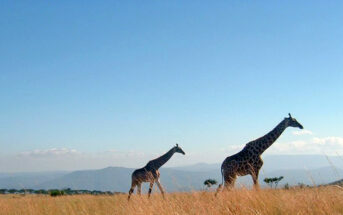 All this set amongst rolling hills and valleys that are home to a vast array of wildlife. Not forgetting the ‘tents’ that my wife Melanie is only too happy to stay in.